IMPORTANT - Restrictions on use STAY WELL AWAY FROM, AND DO NOT OVERFLY, ANY HORSES . WE HAVE HAD ISSUES WITH PILOTS CAUSING A DISTURBANCE TO PONY TREKKERS AND THIS MUST BE AVOIDED if we are to retain this site. 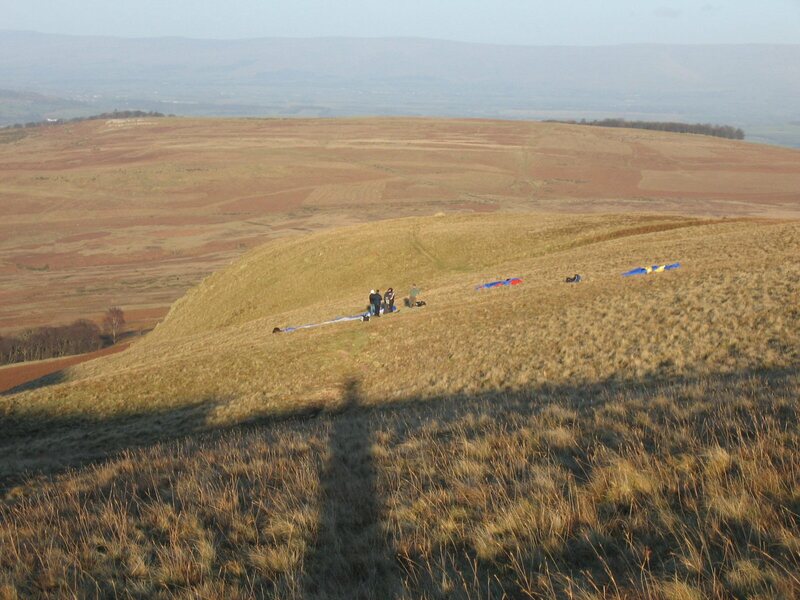 Landing ONLY on the fellside - DO NOT use any grazed fields. Do not overfly or land on the area to the NE of Aik Beck when commercial pony trekking is likely to take place; i.e before 1700 hours daily from Easter to the end of October. PARKING ISSUES. Parking is very limited (see above) and with the increasing popularity of the Ullswater Way the problems are going to get worse. Obey the sign-posted instructions, be considerate. A brilliant site. 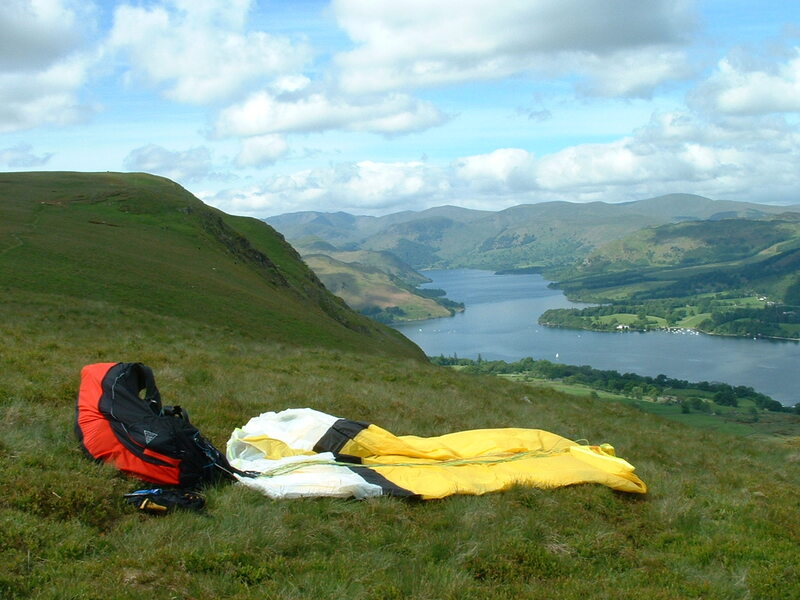 Barton Fell is the long ridge running down the SE side of Ullswater. The site has excellent slopes with the benefit of gentle ground over the back. Lots of potential for XC flights. No formal permission yet so be polite to any farmers. Good alternative to Clough Head if you don't mind a walk. Roe Head cottage. The postcode centre is half way up the road from the crossroads. Car parking is at the top of the road. From the Church at Pooley Bridge follow the road to Howtown but carry straight on at the first cross roads after 500m and park considerately at the end of the track leading to Moor Divock. Grid Ref NY478235. CAR PARKING IS VERY RESTRICTED AT ROEHEAD! The area available for parking is limited to about a dozen cars if considerately parked. The same area is a popular starting point for many other fell users. On a weekend and in the summer it is likely to be rammed by 1000 hrs. DO NOT PARK ON THE VERGES, passing places or block access to property. if you arrive too late to find a space look elsewhere. The usual take off is not that obvious. 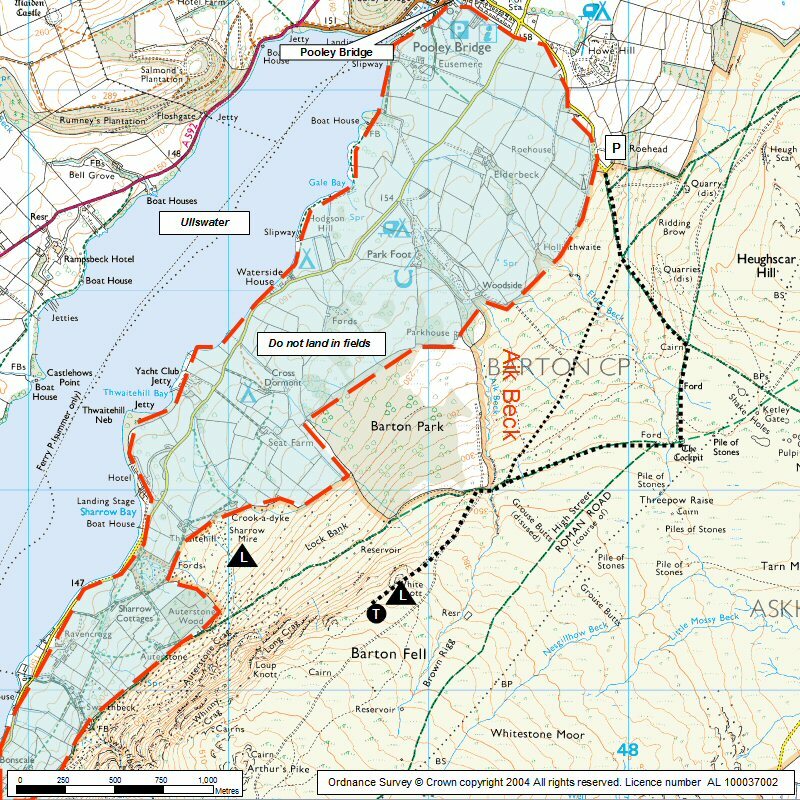 The fellside contains a number of tracks which can lead you past take-off without realising it; use the NE Lakes 1:25,000 map if you're not familiar with the area. 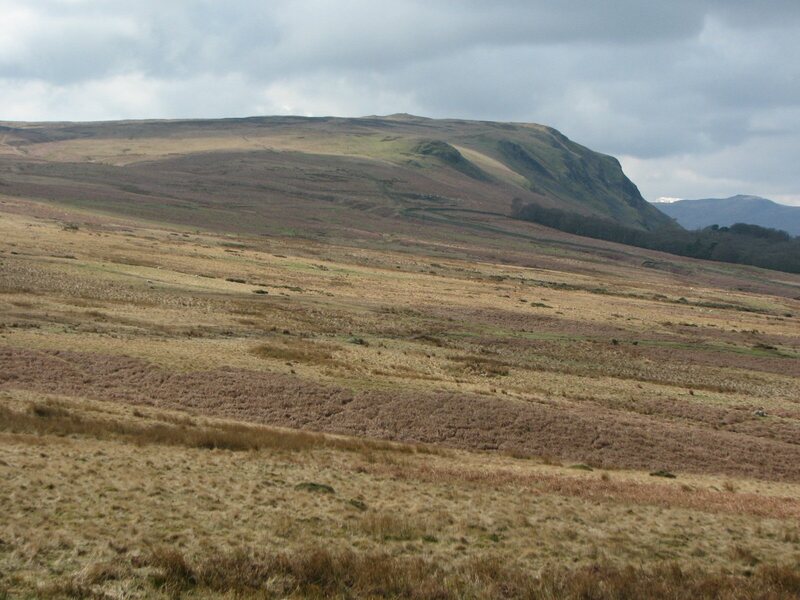 From Roe Head, follow the track from the fell gate up to a large cairn almost at the top of the col. Turn right onto a track and then use the map to locate the correct track at 'The Cockpit". Turn left off the bridleway after Aik Beck before it starts to descend off the fell - you get very close to a wall and Aik Beck is obvious. The usual take off is a grassy bowl; the grass is a bit scuffed from the boots of parawaiters. For the Helton approach there are numerous options, this is the dry one. Take the very obvious track from GR 497315 heading NW for 0.9 miles. 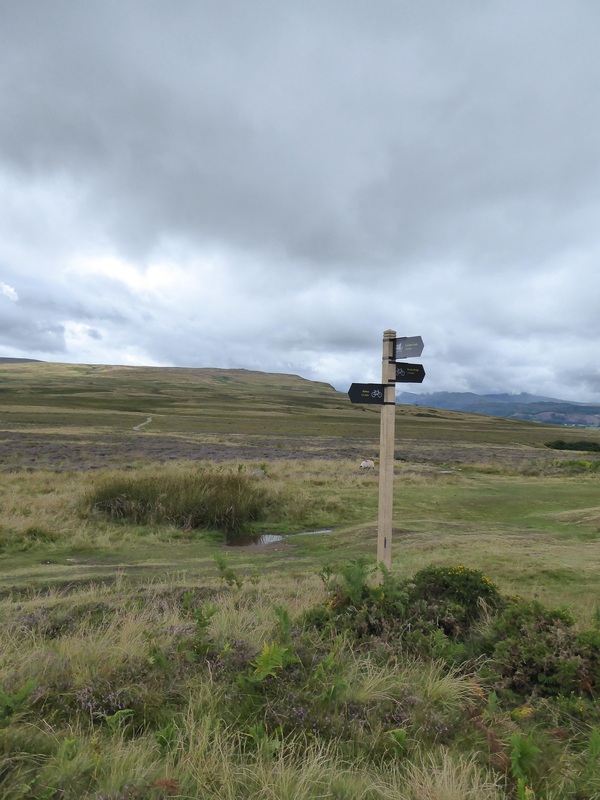 There is a new obvious signpost at the junction (GR 487225) (see photo)where you take a less obvious track WSW and follow it to the Cockpit (0.3 miles) and join the Roe Head route. None yet, but it is common land with many users; walkers, mountain bikers and horse riders with lots of potential for conflict. Please be considerate. The hazards are obvious, there are no hidden traps. Sensible selection of a launch site eliminates any rotor issues. Sea breeze is interesting. It can approach from either the NW or the SW. The latter SB makes launching difficult and potentially dangerous. The SW sea breeze can be observed as it approaches along the Lake which gives time to take appropriate action. The NW SB tends to reinforce the prevailing NW breeze which can be good ... or bad. If it feels too strong it is worth waiting to see if it settles. Occasionally both SBs arrive and meet in front of the launch forming an impressive convergence cloud. Apart from the restrictions mentioned above there are no major concerns over landing. When top landing or bottom landing in the lee of the woods be aware of the possibility of rotor. One major advantage of parking on the Helton Rd is that it is possible to fly downwind to your car without overflying the pony trekking zone. Soaring is excellent in the right conditions. Thermals improve pm once the sun gets on the crags and scree. Massive! Easy ground down wind leads to the M6 and then Tailbridge or the Howgills. Cross the Dales via Swaledale or Wensleydale to the Vale of York and then classic gliding terrain to the Humber and the British Record! Easy airspace until the Vale of York. Looking up to Barton Fell from the start of the access track. Take off is behind the large knoll 10 o'clock from the edge of the wood. Takeoff on a cold, windy day in February 2007 looking NE. The wind died down as the sun sank allowing a short flight to be snatched. The normal parking area at Barton does get very busy so an alternative area is to the east. 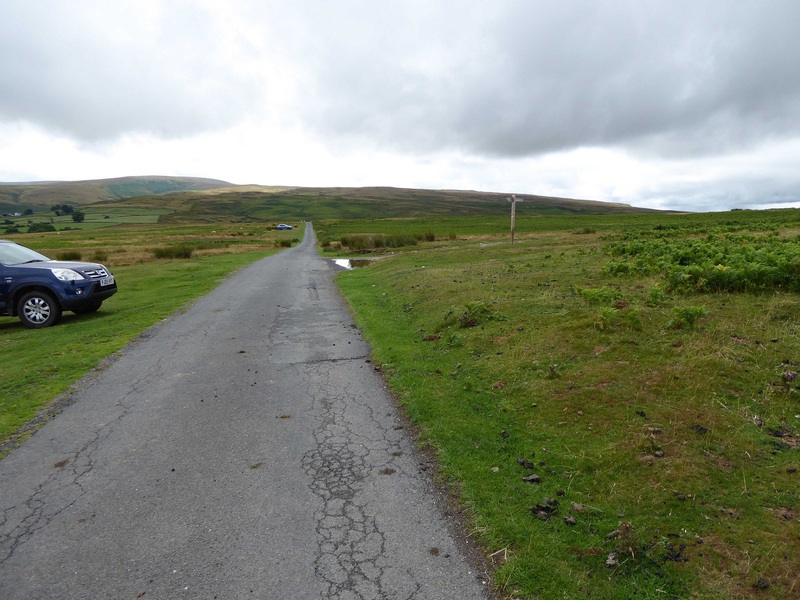 You approach via Askham and Helton to a no through road going SW from Helton. The parking area is at grid reference NY 497 215 by a footpath fingerpost.